Sorry Brandon, but that makes no sense to me at all. I did ask you to list the process steps you went through to apply the texture (material) but you haven't done that. I don't use Sketchup but those process steps may have given me a clue to what is going wrong. Sorry, but I'm not wasting any more time playing 20 questions each time you encounter a problem. That still makes no sense to me. You should be applying grass and concrete to the fighter pen, not a bright red block colour. To do that you need to make the material yourself (grass and concrete on the same sheet) and then map it to the fighter pen faces. You can then convert that material to .dds as an FSX texture. Does Sketchup allow you to do that? It's for you to design the texture sheet (material + texture) and save it. 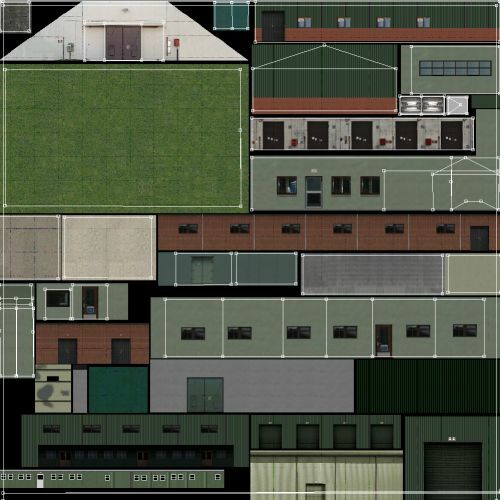 The original size of this one is 1024 x 1024 pixels and serves all the buildings in a weapons area. Each face in the model is mapped (white outlines) to the areas on the sheet. It's called UVW mapping. Ideally all of the buildings in the scene are attached together to form one model, so that 1 model + 1 texture = one draw call, which is great for frame rate. If you do it with a separate texture on each face you will end up with a huge amount of textures and a very poor frame rate. I've had a quick look at a few videos about applying textures with Sketchup and what I have seen doesn't fill me with any confidence. Each texture subject (grass, concrete, wall, door etc) seems to be applied separately. That's not good for performance and it might be what Mark was referring to in your other thread about draw call issues with Sketchup. Maybe someone with mapping experience with Sketchup can explain the process, but my guess is that very few people here are using it for FSX work. Most people use FSDS3 or Gmax. Ok let me try and grasp this, when you are in Sketchup, you draw out your ground box and apply just a colour to it, you then export it as a .dae and test it in MCX to make sure it shows properly keeping in mind that all colours only are stored in the model, if you are adding proper textures they then will be stored in a folder with the same name as the file name! Yes it does John, you can add all your textures to the sheet first, make your model, import the texture and place it where you want on the model.. If you want to get into scenery and aircraft design, you must be able to UVW map. Im quite familiar with how sketchup works having made many models for use in FSX, but you seem to be struggling with basic techniques so far, have you actually managed to attach textures to it as yet and not just colours?